Terrance Hayes, author of "American Sonnets for My Past and Future Assassin." These are sonnets, all right — but no poet in any other age could have written them like this. 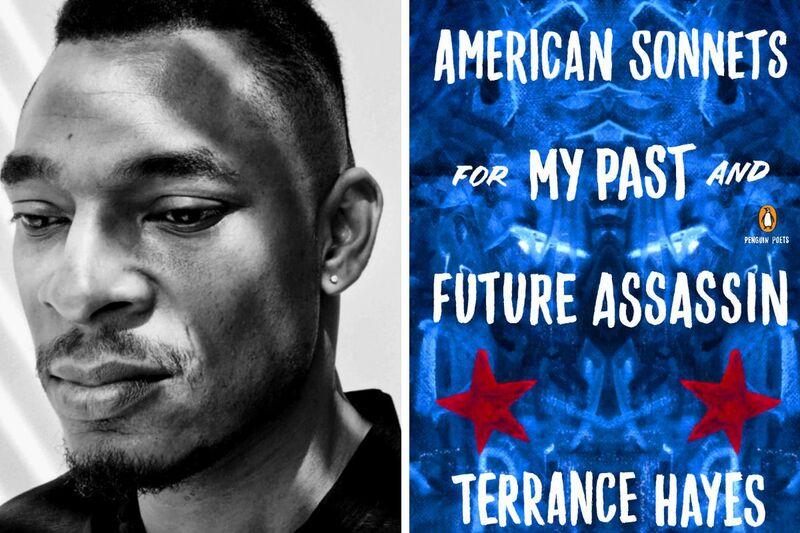 Much-recognized Terrance Hayes gives us American Sonnets for My Past and Future Assassins. These 70 poems concern much of what drives our present moment: the Trump culture clashes; debates over race, gender, and identity; the haunting presence, in every step of American life, of the past, including war, bigotry, Jim Crow, and the sense of endangerment that is an inextricable part of living while black in America. "America's struggle with itself," one poem tells us, "Has always had people like me at the heart of it." True to the poet's art, that me may stand for black men like the poet named Terrance Hayes, and it may also stand for every me shoved to the outskirts. That makes me weep for another life. Define life. Life means something different each time round: personal existence, abstract existence, duration, way of living, and, finally, undefined (undefinable?) term. That challenge, to the reader, to anyone, stops the poem, and the reader, dead. Like the poems, like the book, the speaker of the lines feels himself forever yoked to his assassin, the same one who has killed him in the past and will kill him in the future. Who or what is this assassin? Above all, in this book, the assassin is a condition of life. Ta-Nehisi Coates has written that U.S. culture is a conspiracy against the body of the black man. Some say blacks are crazy to be this paranoid, to feel this endangered. But there's a sentence that floats throughout Hayes' sonnets, again and again, like the return of the irrepressible: "But there never was a black hysteria." There's only the "I" of these poems, the assassin, and what binds them inescapably. "Assassin, you & me: we believe / We want what's best for humanity." Hayes writes. " … Do you ask, why should you die for me if I will not die for you? I do." (Do what? Die for "you"? Or ask the same question?) Elsewhere, we read: "Like no / Culture before us, we relate the way the descendants / Of the raped relate to the descendants of their rapists." The sick, broken race relation in this country is not a feature of capitalism or patriarchy: It is the culture. Of confusion, a contusion before it swells & darkens. Swelling, darkening, this collection, however, is not confined to the political. The sonnet "You know how when the light you spatter spreads" is one of several beautiful poems of love and desire. There is also reminiscence, pictures from (someone's) boyhood and family. An explosion of poetry is being published right now in something of the same tone, aimed at something like the same topics and topicality, reaching for an aggrieved self-justification. Much is being published because of what it says and who is writing it. American Sonnets for My Past and Future Assassin is better than that. It is art, accomplished art, in and of itself, giving us a singular, cherishable voice that commands music, history, and language. Its worth, yes, does involve what it says to us, or makes us think about, this moment in this place, yet beyond that, it does what good poetry does. It slips all nooses and stands on its own merits.